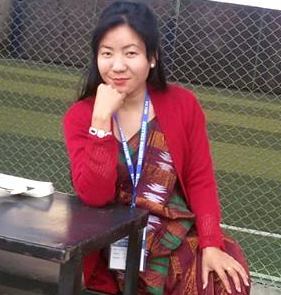 During my ten-month stint teaching English in a public secondary school in Lalitpur district, my greatest difficulty was in encouraging creative production to my students. The students found it very difficult to create spontaneous speech acts, to speak and write in an unprompted and unscripted way. With regards to reading and writing, I found that most of my students had a good command of English vocabulary and could answer questions as long as they were not open-ended. They were very good at answering fill-in-the-gap questions, in which they must find a particular name or action in the passage and write it down as the answer to a question. But they had enormous difficulty when asked to summarize a passage or write down their own emotional response to a passage. The students were having difficulty with creative production. As to speaking, I found that my students were used to being called upon individually to answer a specific question from the text. These questions were typically close-ended: there was only one correct answer. If they did not know the correct answer, they would look for a fellow student to answer for them, they would claim ignorance and quickly sit down, or they would stand in silent discomfort. Aside from one or two confident students in every class, the majority of students stood up to answer questions with a look of mild dread, and then answered as simply, quickly, and quietly as possible. I believe that one solution to this problem is to give students many opportunities to practice speaking English without being put on the spot. This means creating activities in which students work in pairs or in small groups to practice dialogues, write and perform their own dramas, or play simple question-and-answer games. Students who are too shy to answer direct questions during a lecture are much more willing to speak English to their friends during group activities. It is also necessary to foster the ability to give spontaneous answers. For this it is crucial that students learn to say the same thing in multiple ways (“How are you?”, “How is it going?”, “How are you doing?”, “What’s up?”, “What’s new?”, “Are you well?”, etc.). Speaking practice should not be about carefully translating the one correct answer from Nepali into English without any flaws in grammar or pronunciation. It should be about developing the ability to communicate. As a student learning the German language, my teacher introduced me to the German word umschreiben. Whenever I was speaking in class and I was stumped by my inability to remember the German word for something, instead of giving me the vocabulary word I needed she would tell me that I must umschreiben. This means to paraphrase, to circle around the elusive word, to use all of the words in German that I did know to describe the word that I did not. This is a very valuable skill because it develops creative production and the ability to communicate even when knowledge of vocabulary fails. One way to encourage spontaneous speech in a class where students have little speaking practice is to play language games that require students to quickly think of something to say. For example, with many classes I played a collaborative story game. The first student in the first row would yell out the first word of a sentence, the next student would yell out another word that adds upon the sentence, and so on down the line until the sentence is complete and a student yells out, “Full stop!” These sentences can be remarkably creative and are frequently hilarious. Turning briefly to reading and writing skills, I found that my students needed a lot of practice to produce completely novel sentences on their own. I lead some projects in story writing, letter writing, and cartooning, in which each student was required to put his or her own thoughts on the page. We would brainstorm topics and structures as a class, and then each student would have to write their own stories or letters or cartoons. The goal of all of these exercises is for students to learn to do more than just rearrange the words and concepts that are given to them, or that they have memorized as a sequence of simple scripts. They must learn to use English to express their own ideas and concepts, to go beyond simple reaction to creation. If we can foster that ability, examination scores will be much higher and students will have more confidence in speaking and writing. Creative production is essential if we wish our students to learn English as an actual language, a useful tool for communication and business, and not as a mere academic exercise. Luke Lindemann was a 2010-2011 Fulbright English Teaching Assistant in Shree Udaya Kharka Secondary School in Chapagaon VDC, Lalitpur. Before receiving this grant, he worked as an English teacher for Bhutanese refugees in the United States. He holds a Bachelor of Arts in Linguistics from Pomona College, and his primary interests are language issues and education. I find Luke’s post very thought-provoking and useful. Many teachers just think about poetry if you mention creativity; that’s simply unfortunate. Creativity is a defining feature of language learning (even if you dislike Chomsky for the alleged Anglo-centrism in his theory of language, generative or creative production of new structures by using relatively limited resources fundamentally defines human language). Luke, thank you very much again, not only for doing the hard work of teaching in my home country but also sharing great ideas as well. I will always remember the class activity in Luke’s post last month. This one was equally thought-provoking. Having share that comment, I will say again that I found Luke’s post very interesting and useful. Let me conclude this comment by mentioning another point that I found worth thinking about: “If we can foster that ability, examination scores will be much higher and students will have more confidence in speaking and writing. Creative production is essential if we wish our students to learn English as an actual language, a useful tool for communication and business, and not as a mere academic exercise.” I will just say amen. I have always done very well in exams, but I will be damned if I don’t say that I think they are a nasty thing as a means of education: when an exam does one good thing to students … leaves them with at least two good insults! After Google-ing ideas for how to imbue creativity in younger students with limited resources, I stumbled across your blog. I am currently experiencing the exact same situation, but I am in Ho, Ghana. The first language here in the Volta Region is Ewe, but the disconnect when teaching is more based on the students’ struggle in formulating their own ideas and opinions. Their critical thinking skills are completely absent since they have been spoon-fed facts their entire school career. As someone experiencing something similar, do you have any advice based on your experience? I’m teaching a class this summer based on creativity and imagination and am using many of the same techniques, but any pointers would be greatly appreciated.